At this post-postmodern cultural moment, when so much visual art is either visually unprepossessing or else incomprehensible without theoretical buttressing, it is a pleasure to dive into the generous, gritty, poetic abstractions of the veteran Bay Area painter Mike Henderson. Decidedly traditional in style, employing Synthetic Cubism’s floating color planes and Abstract Expressionism’s turbulent paint and ambiguous ideographs/hieroglyphs, these works give themselves to the viewer and generate their own force field; they create an eternal present, and we respond almost viscerally, as if to living things. Henderson, who could well be California’s deKooning, says that after 40 years of painting he now wants to make every mark count. The 10 oil paintings in Now, ranging in size from 3’ x 4’ to 5’ x 6’, realize that intention, both as authoritative individual works and as a collective group in this fine installation. One notable change is that Henderson has lightened his palette considerably in recent years. Seven of the works depict a celestial orb over nocturnal waters, and in the mid-toned, predominantly gray Grape Vine and The High Road, white is the background color into which Henderson’s mark-making injects energy and human presence. 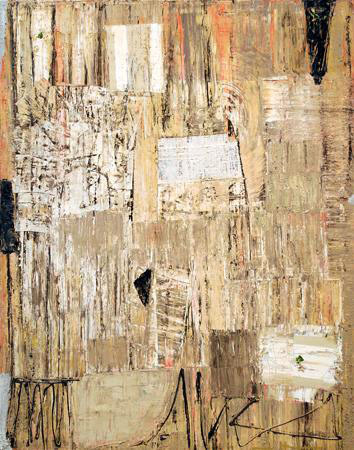 Whether white has some symbolic or narrative meaning for the artist is unclear, but the neutral tone makes an ideal backdrop for the artist’s scraped and troweled color excavations. 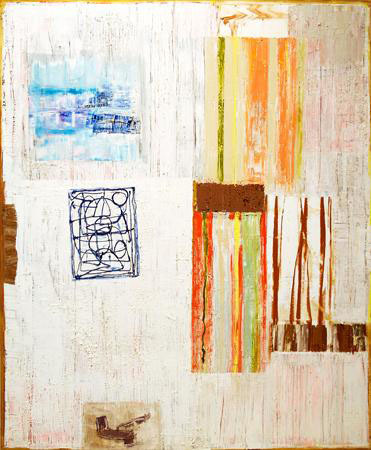 Like Jasper Johns, Henderson conjures abstract universes from constrained means, but his exuberant physical matrices make Johns’ atmospheric, encaustic fields feel quiet and introspective by comparison. The Nearest Distance and Again Always are fields of white paint laid down in bricklike horizontal and vertical strokes over colored undercoats; simple drawings made with a pointed tool pushed through the wet paint, they suggest faded graffiti, tattoos or tattered manuscripts. Henderson also has a predilection for the weather-beaten. He once, like Munch, left canvases outside (before starting work rather than after as Munch did); and his pre-aged, heavily worked paintings seem to acknowledge human limits and life’s difficulties. There’s no gestural abandon in them. 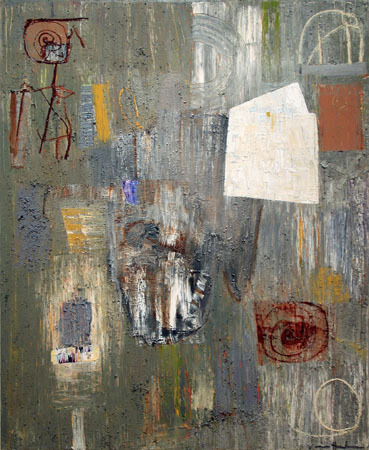 The seven remaining paintings contain blocks of color that have been scraped away from the background hue, suggesting base coats revealed by hasty tape removal or deposits mined from the earth. In Grape Vine, a house-like, pentagonal shape glows in the gloom; and in Broken Core, I Will Remind You, and Around the Curve, internal shapes or squiggles within clearings suggest drawings or paintings, possibe references to Matisse’s famous crimson-colored Red Studio, but without the canvases leaning against the walls. It would be helpful to give address and hours of galleries.